Daytime rain brings a quick rise in the Humber. There was heavy rain in Toronto last night but unlike the flood events of 1954 and 2013, the overnight rain was relatively local and not spread over the Humber watershed. This morning I took a leisurely stroll in the humid morning air and was surprised to see the relatively low level of the water. At 8:30 this morning, a relatively low level. By the afternoon, things had changed. More rain had fallen in the broader catchment area and the river’s quick rise was apparent – not as spectacular as 2013 but impressive nevertheless. By 5:30 this afternoon, there was a lot more water and sediment. On July 9th, 2013, this is how the Humber looked from the same vantage point when the water was beginning to subside from the previous day’s rain. July 9, 2013, 5:45 am. The old footbridge foundation is completely submerged and may have even been shifted by the current. Incidentally, workers repairs the bridge boards yesterday – many were rotten through. I don’t understand why they don’t replace the wood with metal ‘boards’ that would last much longer. Bridge boards don’t last long as they’re not chemically treated. This is because preserved wood leaches toxins into the river in wet weather and would harm aquatic life. This entry was posted in Humber River, Park management, Raymore Park Footbridge and tagged flooding on 2018/08/08 by Roy Murray. Housing was once scattered along the length of the Humber. Quite a few were built on the valley floor in present day Raymore Park. Raymore Drive used to stretch down into the present-day parking lot and Gilhaven Avenue. It must have been an idyllic location with nature close at hand, rich flood plain soil and an easy walk to the shops and transportation links in Weston. Interestingly, I was talking to long time Weston resident Douglas Tucker and he mentioned that until the mid-1960s, Weston was a shopping destination for people from as far away as Palgrave and Bolton thanks to a regular train service. 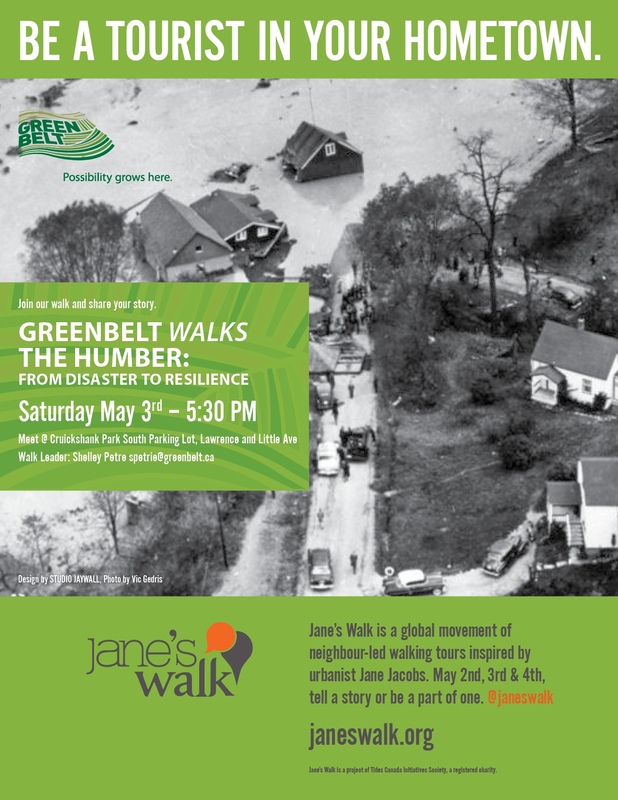 In Raymore Park, few traces remain of the houses once located here before they were either swept away during Hurricane Hazel or demolished by authorities in the aftermath. 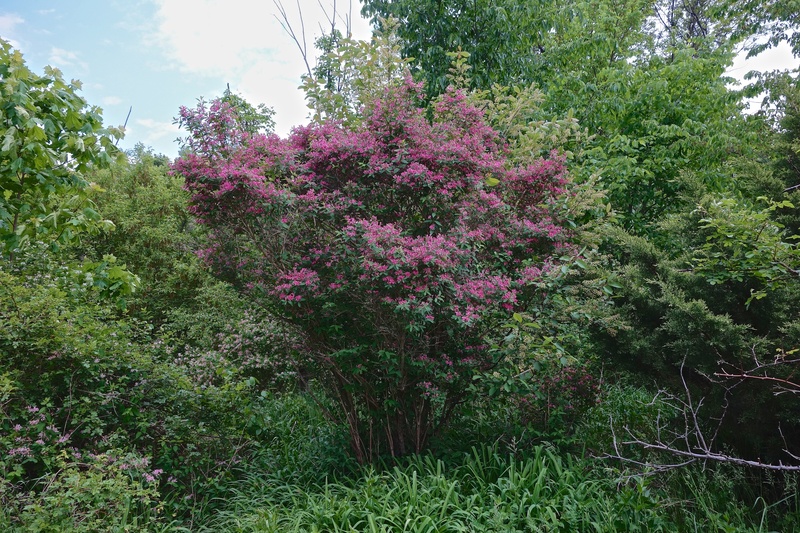 Every spring however, flowering shrubs are living reminders of the families who cultivated gardens here more than fifty years ago. 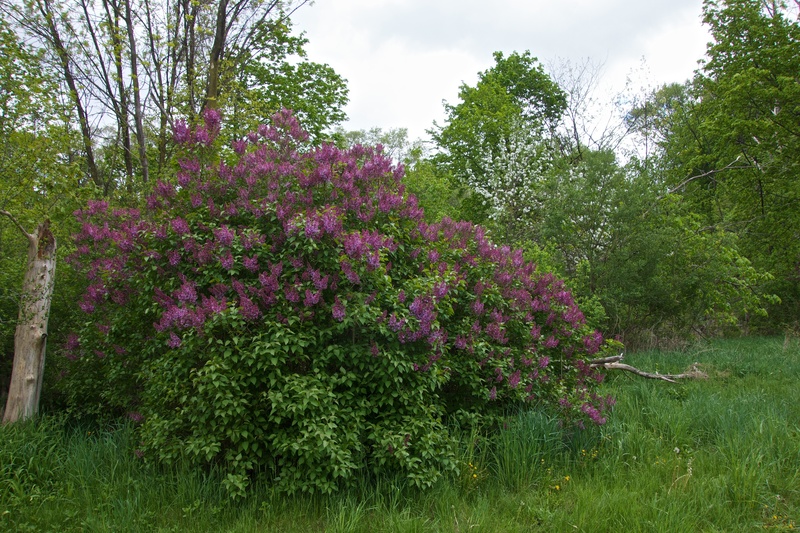 This is one of two beautiful lilacs that bloom faithfully every year. 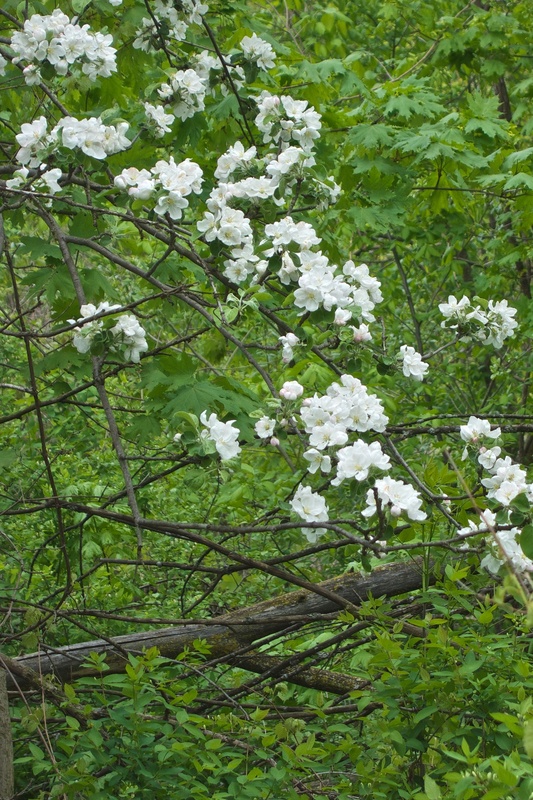 Apple blossom pokes its way through the surrounding trees. Along with the day lilies in front of it, I don’t know if this beautiful honeysuckle is a remnant or not. 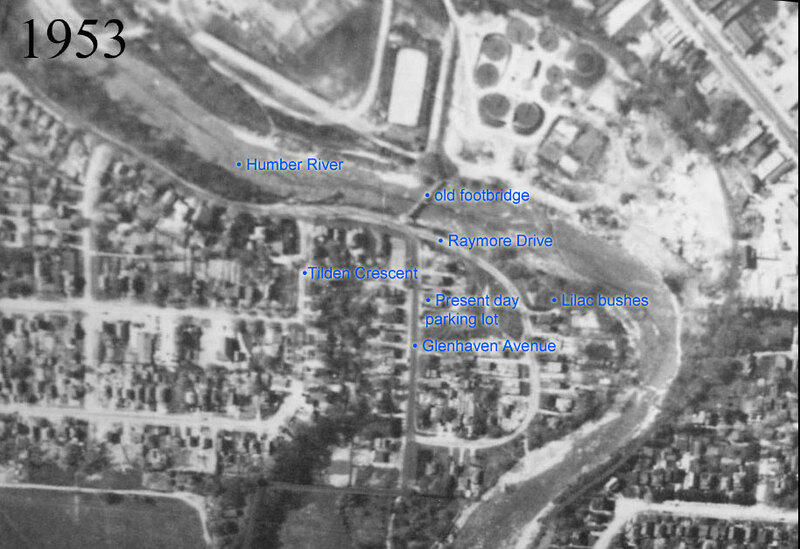 This City of Toronto Archive aerial view has been labelled to show the location of some of the streets including Gilhaven Avenue which no longer exists. The present-day lilac bush and parking lot locations are marked. The Humber still follows the same approximate course. Aerial view of Raymore and Gilhaven in 1953. 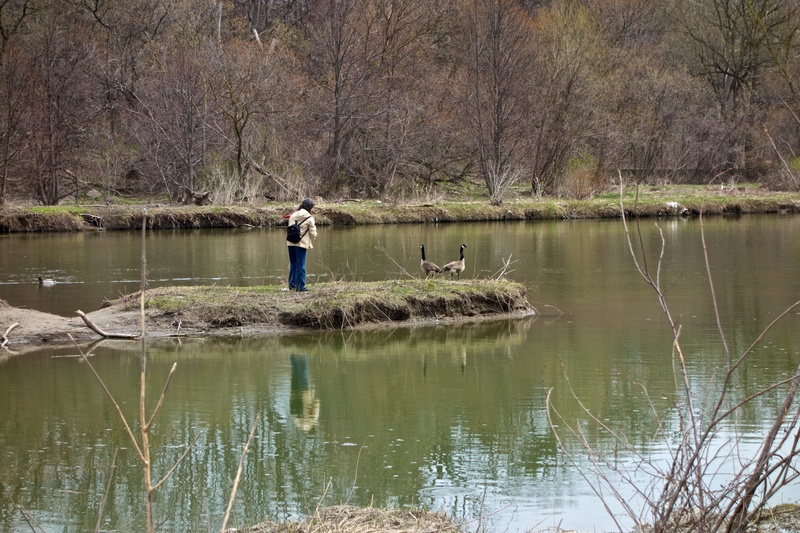 This entry was posted in Humber River, Hurricane Hazel, Park view, Photography, Raymore Park Footbridge, Wildlife and tagged Glenhaven Avenue, Hurricane Hazel, Raymore Drive, Raymore Park, Weston on 2013/05/12 by Roy Murray. The onset of warmer weather is the worst possible time for wildlife in the park. Many animals are in the most crucial part of their reproductive cycle and increased numbers of people add a considerable burden to their lives. Fortunately, numbers decrease as the season progresses and the novelty wears off. Today, this gentleman let his very active dog off leash at the entrance of the park and it ran to the footbridge flushing out wildlife as it went, causing considerable distress to wildlife, pedestrians and cyclists. Many people seem to regard the park as a leash free zone. This lady decided that the zoom on her camera was insufficient so she had to impose herself on these poor geese, giving them no option but to leave their peninsula. The small island in the distance is about the only safe place for nesting birds and other animals. 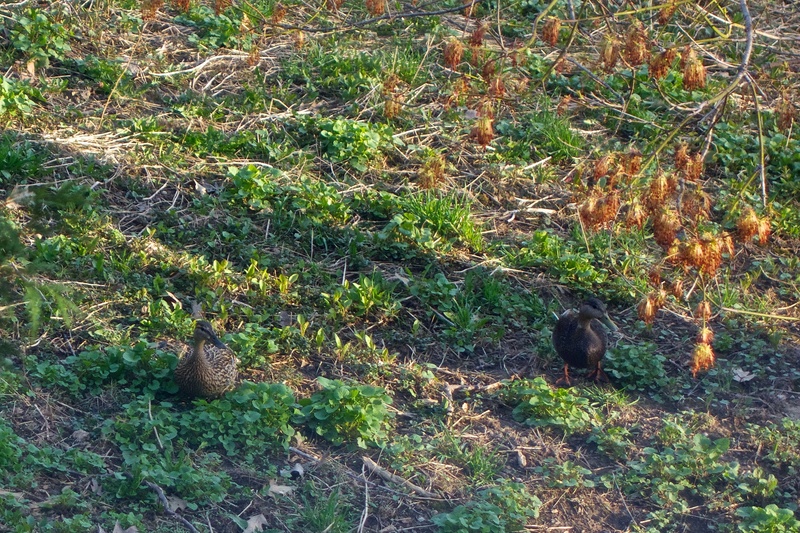 On a happier note a pair of American Black Ducks were waddling in a corner of the park this morning, snacking on new growth and happily out of sight of unleashed dogs. It’s possible that they are in the process of migrating from the southern U.S. to summer grounds further north although some stay here year-round. 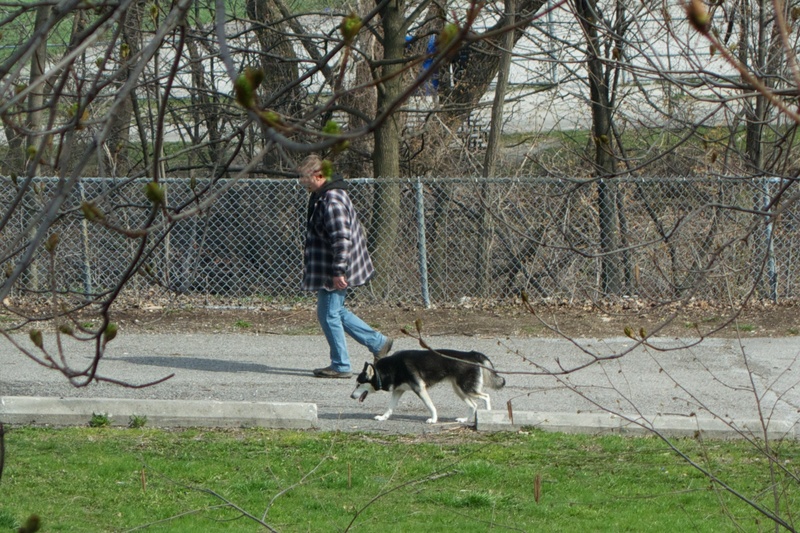 This entry was posted in Dogs, Park Abuser, Raymore Park Footbridge and tagged Raymore Park, Toronto Animal Control, wildlife on 2013/04/28 by Roy Murray. The Humber footbridge looks good from just about any direction but this view looking north features the old suspension footbridge abutment in the foreground. The Humber footbridge and the old bridge abutment on a late winter’s day. 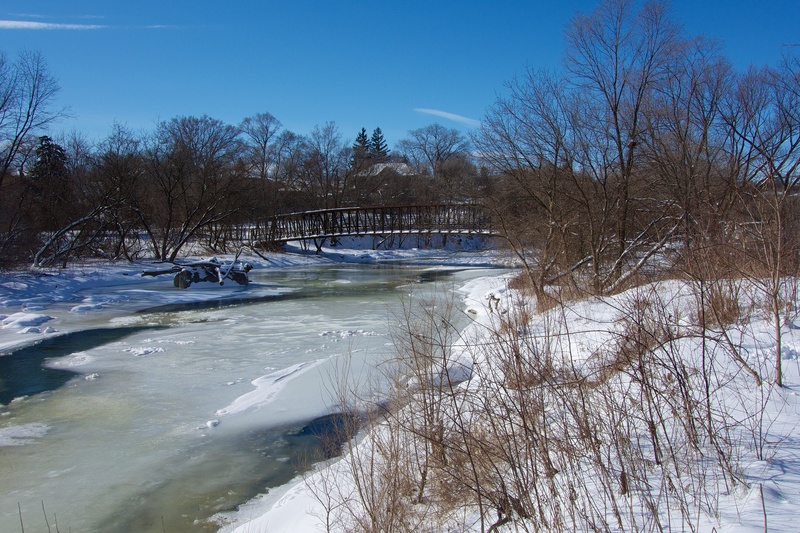 The footbridge was installed in 1995 (after an absence of 41 years) with provincial help, as part of the goal to have a waters’ edge trail from Lake Ontario right up to the Humber’s source on the Oak Ridges Moraine. As part of this goal, this summer, a 600m extension will move the end of the trail from its current location in Cruickshank Park to a set of steps by Weston and St Philips Roads. At the moment there are negotiations around land ownership issues further along the riverbank – hopefully these will be resolved soon. 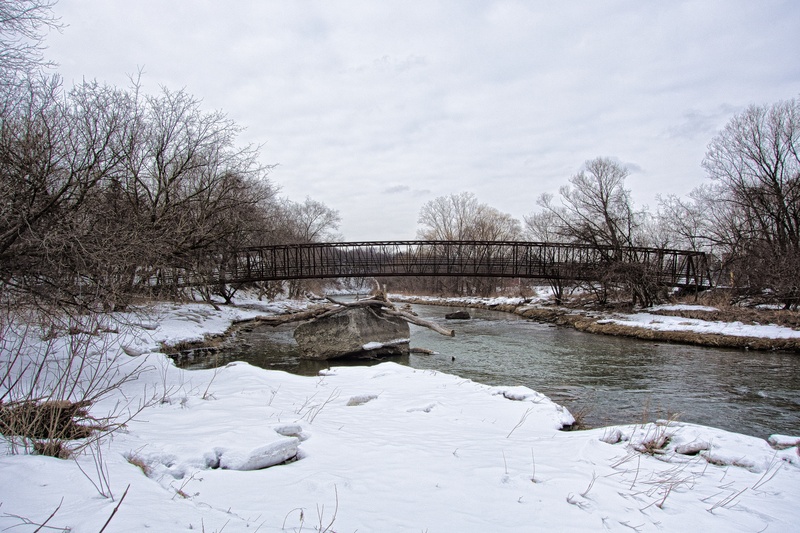 This entry was posted in Humber River, Photography, Raymore Park Footbridge and tagged Cruickshank Park, Humber trail, photography, Toronto, Weston, winter on 2013/03/06 by Roy Murray. Another winter view of the footbridge. This is the Humber footbridge from the other side of the river. The old bridge abutment is on the left centre of the photo. More people were in the park today as the path has been beaten down by the pioneers! A nice sunny day with some interesting shadows on the snow. 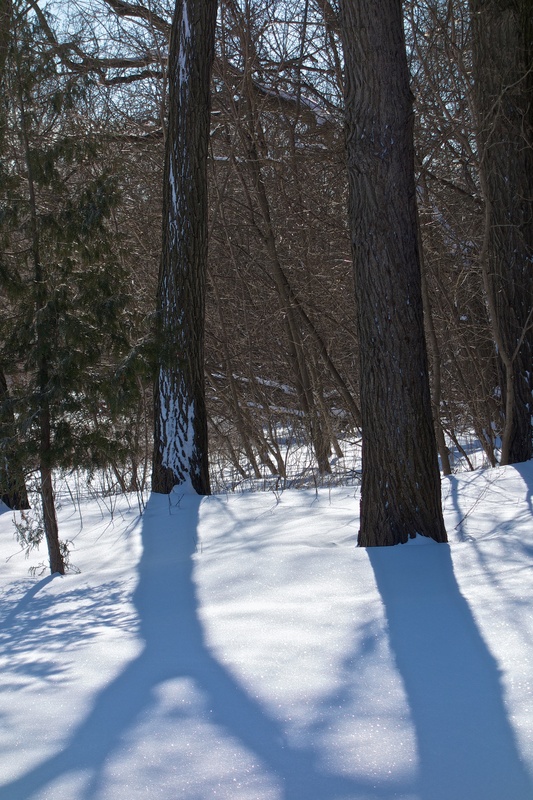 A couple of Siberian Elms cast their shadows. This entry was posted in Humber River, Ice, Raymore Park Footbridge, Snow and tagged lions park, Toronto, winter on 2013/02/10 by Roy Murray. Mugsey mugs for the camera. Today is a grey and misty day as the latest warm front has arrived dumping snow, freezing rain and now plain old rain. Mugsey decided he would scratch himself on a tree and he posed nicely for the camera. 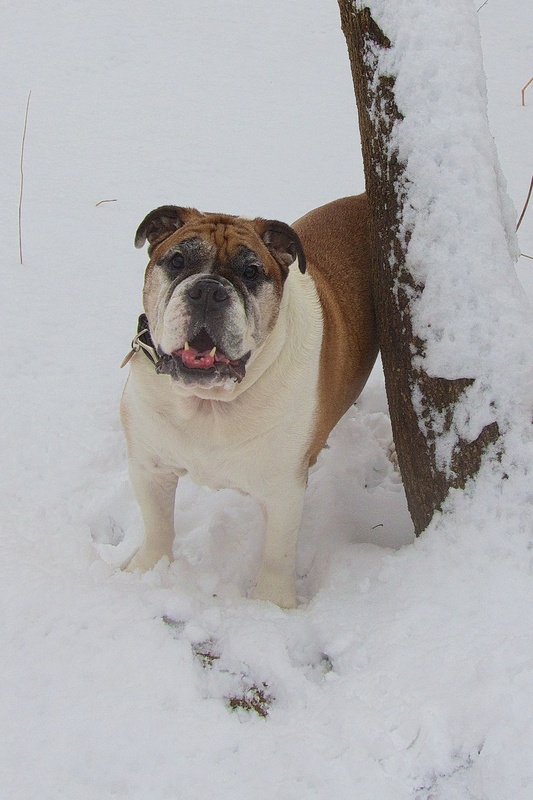 Mugsey loves the snow – can you tell? As we were passing by the bridge, a pair of young white-tailed deer moved silently past on the other side and cautiously crossed over the ice into Raymore Park. Even though the zoom on the RX100 is only 3.6, the sheer number of pixels (5472 x 3080) allows for some zooming at home – especially in this medium. Apologies for the pole in the middle of the picture. There is lots of feed above the shallow layer of snow to keep them going – we’ve had a pretty easy winter so far with rain and mild temperatures predicted for tomorrow and especially Wednesday (13°C). 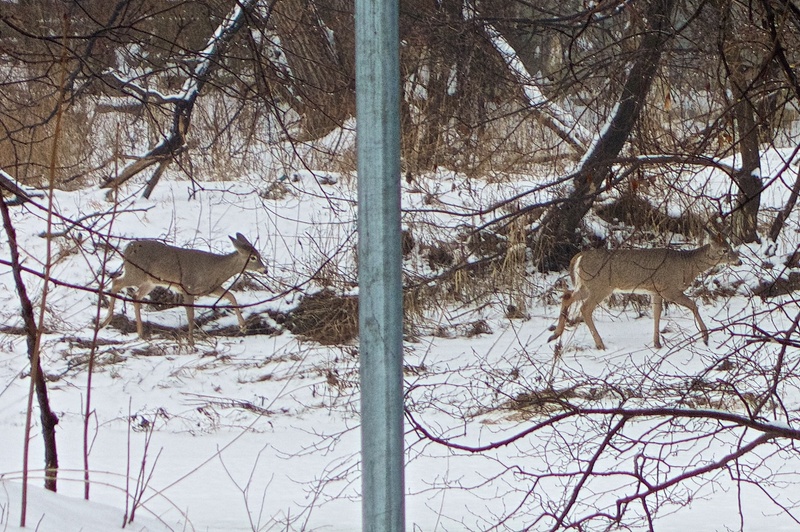 This entry was posted in Dogs, Humber River, Photography, Raymore Park Footbridge, Snow, Wildlife and tagged Mugsey, white tailed deer on 2013/01/28 by Roy Murray.